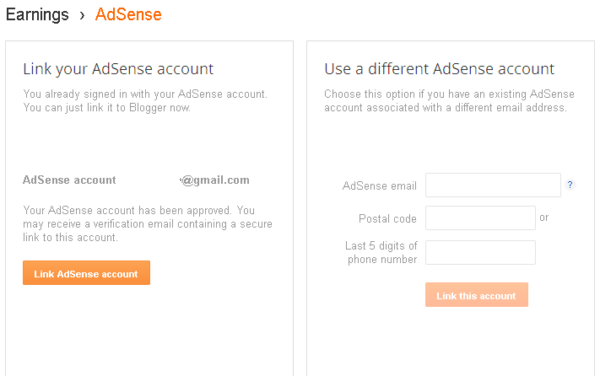 To use Adsens on Blogger (Blogspot) blog is easy- Blogger has build-in support for Adsense, that means, you can apply, enable and add Adsense just from one place- the dashboard of your Blog, without touching the Adsense codes. If you'd like to add Adsense inside the post, in header, footer, or at the bottom of the page, you have to add the Adsense codes manually to a gadget or the template's HTML. 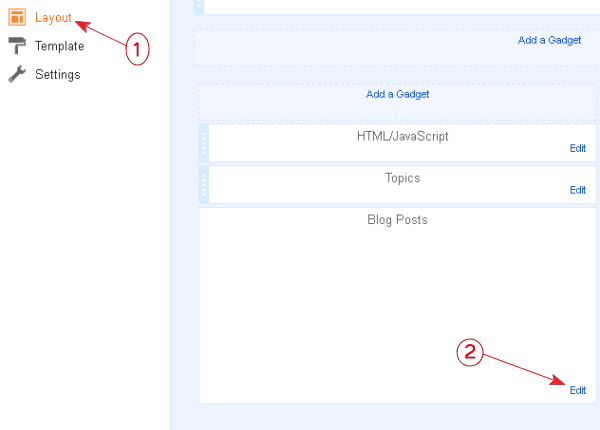 To use the build-in Adsense feature in Blogger, first you need to enable it. Here's how. If you do not have a Adsense account yet, please check my previous post "How to Get Adsense Application Approved by Google ?" If your Adsense account has not been approved yet, let's wait until approved. If your Adsense account and the blog are under the same Google account, then at the left-side window, click on "Link Adsense Account" to confirm. I assume you are using this option. If your Adsense account is under a different Google account with your blog, you fill in the form at the right-hand side, to link to that Adsense account. For option 2, make sure you choose Yes for "Show ads on blog"
For option 3: choose "display ads in my sidebar and posts", if that what you want. Other 2 choices are "sidebar only" and "posts only"
Then, make sure to click on the orange Save Settings button at the top-right corner to save your settings. 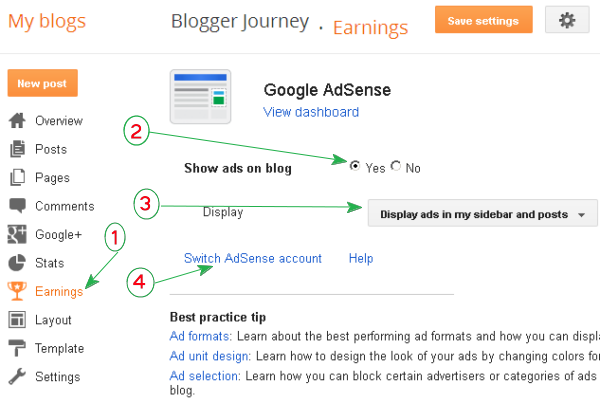 Once saved, Adsense has been enabled on your Blogger blog. (3) What size of ads do you like to show? Size in pixel. (4) What type of ads do you like to show? "Text only", or "Text and image"
(6) Automatic preview. It shows you how the ads will be looked like. You can do the same as in my post by choosing "Show after every 2 posts". 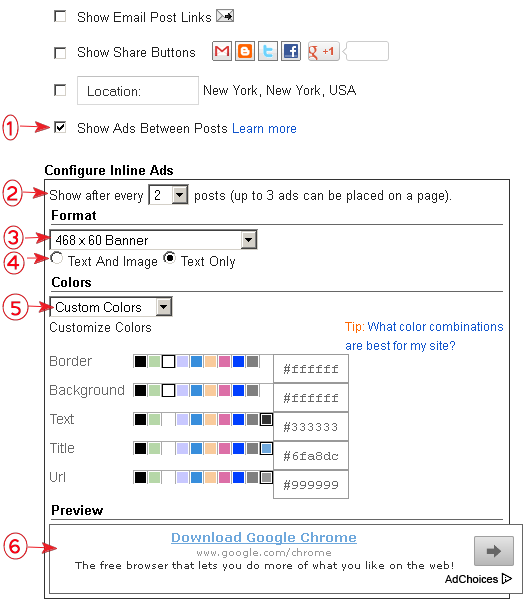 Adsense will be able to detect other 2 ad units automatically and only display one ad unit after your 2nd posts. I am trying desperately to figure out how to manually put adsense ads in, without using the "show ads between posts" in blogger because using that there is no way to track the ads. What I want to do is insert the adsense code into the html and have it show up for 3 posts between posts just like the "show ads between posts" in blogger does, but manually - so I can track the earnings better with the manual code insertion. I see that code can manually be inserted in the posts themselves in the html, and between posts, however the problem is when it shows up between the posts using manual code it shows up fine below the first 3 posts, but then after that there is a huge space between posts where the ad is not showing up after the 3rd one. Is there a way to insert adsense code into the html so it shows up for the first 3 posts, but then doesn't make a space for the rest. Basically I want to be able to do what blogger does (put ads between posts) but manually. good tutorial man.. but i like something difference.. i want to add adsense between post and can be seen only on my homepage?